“Thanks for an amazing product! My aunt bought me a bottle because she had such success with it years ago. 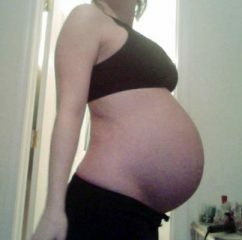 I went through a TWIN pregnancy and have NO STRETCH MARKS at all! I’m so glad that it was all natural ingredients as well! Thanks for helping me keep my pre-baby skin! First of all, I am a stay-at-home-mom of three: a 15 y.o. girl, a 6 y.o. boy and a ten month old. When I was last pregnant I discovered your Mother’s Special Blend Oil and was hooked. It is perfect! It actually moisturizes, doesn’t leave you greasy, it doesn’t make me break out, which is a miracle because everything else does, and it smells like chocolate! “I just wanted to let you know how much I’ve LOVED this product: Mother’s Special Blend. 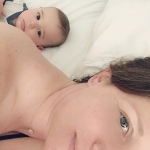 “I started using Mother’s Special Blend 4 years ago when I was first pregnant (32 years old). A saleswoman at Henry’s Marketplace suggested it to me. I used it before and after I gave birth to my 10 lb, 9 oz first child (needless to say, my stomach was huge!). I had not one stretchmark after all was said and done. Now, I just gave birth to my second child. I used it again and am still using it as I watch my tummy decrease. Again I did not get stretchmarks. “I love how this blend is full of oils, yet it is not greasy and doesn’t get my clothes dirty. The smell is also wonderful and not overpowering. You’ve created a wonderful potion! “Now, when my friends get pregnant, my gift to them is a bottle of Mother’s Special Blend. I hope it works for them as well as it did for me. — Lori Mathis, Longmont, Co.